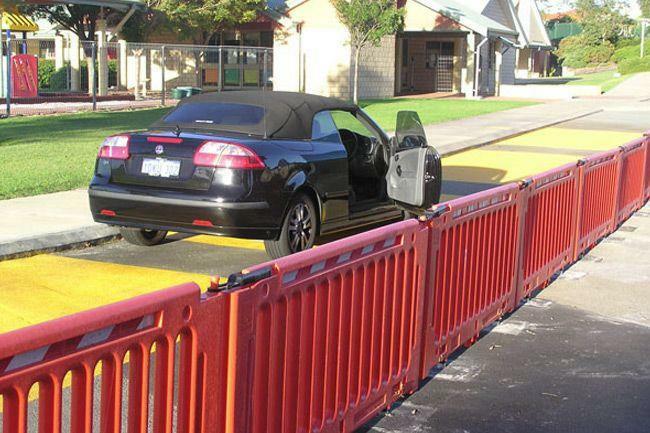 Barrier Group's Q-Fence used as an effective traffic control system has shown versatility in solving one of every school's nightmares - the dreaded "Drop-off" and "Pick-up" zones! An area was set aside within the school's grounds where car arrival and departure could occur. The portable, interlocking, high-visibility safety fence panels was set up both as a delineator and as a protective barrier for school children (and parents). Parking drop-off and pick-up "bays" were painted on the road surface to help mums and dads choose a safe parking spot. An extensive education campaign was undertaken by the school in enlightening the parents and children about the need for safety and how the system would best work. Monitors (teachers and lollypop men and women) were initially used to regulate the amount of time spent in the drop-offs and pick-ups and to help the smooth and safe operation of the system. The nightmare associated with Drop-offs and Pick-ups is now a thing of the past. Each panel is lightweight and easily transported by its very own trailer or Q-caddy if required - up to 20 panels can fit/be transported at any one time.